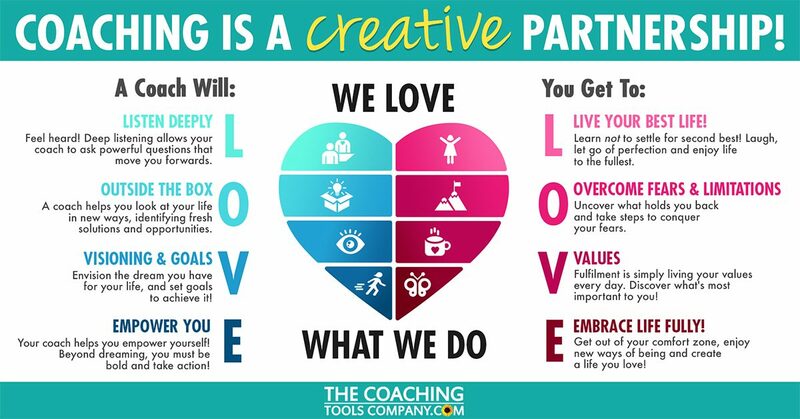 As our Valentine to all you fabulous coaches, we created this brand new coaching infographic to celebrate coaches and the creative partnership - using LOVE as an acronym! What a perfect way to celebrate Valentine's Day! NOTE: Want to share JUST the infographic (and not the whole article)? Right-click (or Ctrl+Click on a Mac) to save the full-size infographic below to your device, then simply share the saved infographic direct from your device! Use this coaching infographic on your social media to draw attention to coaching, what you offer - and the benefits of coaching! Happy Valentine's Day. Tell us what YOU think of this coaching infographic! We'd love for you to comment & share below! 25 Affirmations of What's Inside A Coach's Heart! Our CELEBRATE YOU! Infographic to Share with 12 Tips to Help You & Your Clients Celebrate Your Year! Is the Life Coaching Infographic brandable? LOVE all of this! Thank you. And it's all true. This really speaks to me! Thank you! Love it! Positive easy to read as a visual. Explains simply what we do! It is great! I love the definitions and the design. Great idea! can we reuse it with your website name on it as a picture? Thank you! Thanks so much! The infographic captures exactly what we do as coaches and what clients gain. It's a great tool! Thanks a lot for sharing it with us! It's awesome! Explains the coaching experience. Can we purchase a copy?